Ruellia elegans is an elegant form of Ruellia spp. 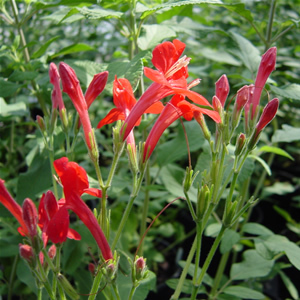 with it’s large pubescent leaves and bright red tubular flowers that float on top of the foliage on long slender stems. These beautiful flowers have 5 petals and they open in the morning hours. Don’t let the fragile appearance fool you though, because this is a really tough plant that can withstand high heat and humidity. Plant in loose, rich soil and keep moist. Brazilian Petunia is attractive to hummingbirds, butterflies, and is a food source for the Texas Crescent Butterfly. Will reach 12-18” tall with an 18” spread.